There are a lot of good camera apps in the Windows Phone Store, most of which are better than the default app built into Windows Phone itself. For example, I use the Nokia Camera app for all my photo taking needs because I like the controls better and I think it produces a slightly better photo because of how the app renders the photo. On my Lumia 1320 I have a camera button on the side but by default it is set to the camera app built into Windows Phone. Changing this however is easy and can be done in Settings. By changing your camera app in Windows Phone you can have your favourite camera app literally a click away. will see the Photos + Camera settings. Tap it to bring up the settings page. The setting we are interested in for this How To is the Camera app. 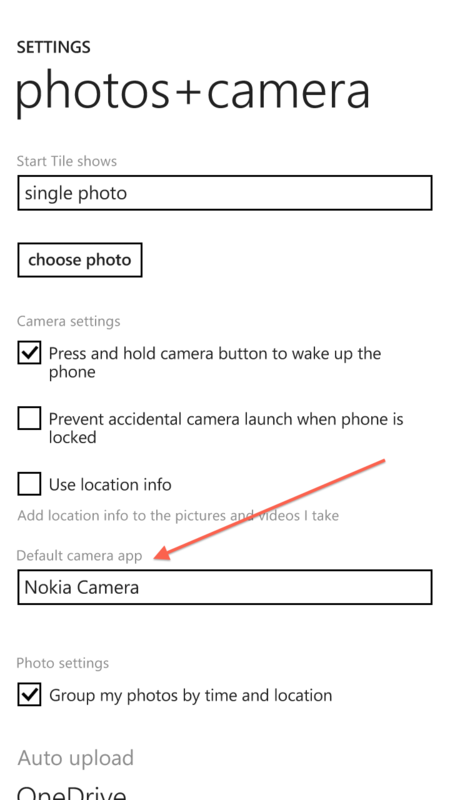 Tap that and you can select your new default camera app in Windows Phone. This will make sure that when you tap the camera button on your phone that it starts this app and not the default app. Once you have selected the camera app you want to use, tap the Back button to get back to Settings then your Windows key to go to your Start page. Now press the camera button on your phone. If you did the settings right the newly selected camera app should open. While we are on the subject of the Photos + Camera settings page, have you set up your photos and videos to be automatically uploaded to OneDrive? If not you should. It’s an easy way to make sure that your photos and videos are safe if something were to ever happen to your phone. 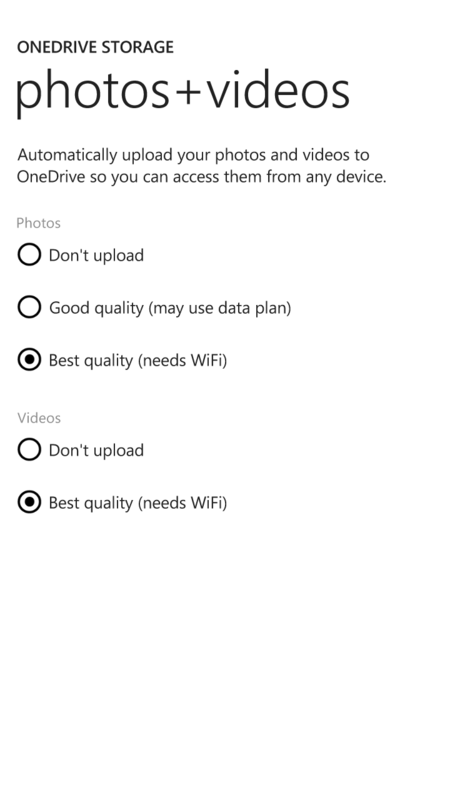 Scroll down to the bottom of the page and you will see an option Auto upload for OneDrive. Tap it and this will bring you to the OneDrive auto upload settings. Here you can select not to upload photos and videos or select a Good or Best quality photo and video upload. Good will compress the photo while Best is going to leave the photo as the original. On video you only have the option for Best quality and it will require that you be connected to WiFi to upload at Best level. Once you are done, Back button your way back to your Start screen. 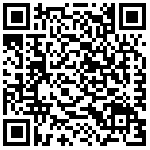 For those who haven’t tried out the Nokia Camera app, I’ve included the QR code to download it below. I personally use this app and really like it as it gives a fair amount of control. Have another tip or trick? Leave me a comment below or Tweet me up. Learning is a group effort! Be sure to check out the rest of my How To’s on the How To Page here on the site.